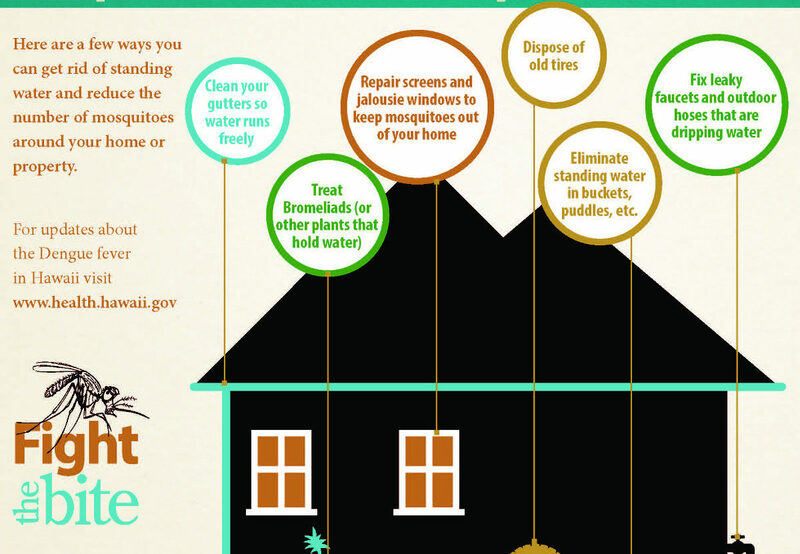 Back in September, the Big Island dengue fever outbreak was making headlines and putting residents and visitors on edge. But now, after several months of eradication efforts and cooler temperatures, Hawaii officials say the dengue fever outbreak is over. Perhaps the most relieved government agency is the Hawaii Tourism Authority (HTA), charged with overseeing Hawaii tourism. George D. Szigeti, HTA president and CEO had lots to say, in response to the announcement by the State of Hawaii that the spread of dengue fever on Hawaii Island has been stopped. “Today’s report that the dengue fever outbreak on Hawaii Island has been halted is a huge relief for residents and tourism industry partners statewide, as well as travelers planning a Hawaii vacation.Travelers can book and experience all of the Hawaiian Islands with confidence and without hesitation. The report cited the fact that there have been no new locally acquired cases of dengue fever on the Big Island over the past 30 days. The final day of the infectious period for the last reported case was March 27. Since then, three periods of the maximum human incubation period of ten days have passed with no new cases reported. That’s great news for residents, but also for potential visitors who may have held-off on booking Big Island vacations due to the outbreak. The Hawaii Department of Health created updated maps on a regular basis, so residents and visitors could track the risk-level associted with different areas of the Big Island. “Hawaii is fortunate that locally acquired cases of dengue never got beyond Hawaii Island, and that the vast majority of cases occurred before February. Despite negative publicity associated with the dengueoutbreak, visitor arrivals statewide, including those for Hawaii Island, are ahead of last year’s record-setting pace through the first quarter. That speaks well of Hawaii’s enduring brand as a quality global destination and to the response of both the State and County of Hawaii in halting dengue,” Szigeti added. Starting on Sept. 11, 2015, there have been 264 cases of locally acquired dengue fever confirmed on Hawaii Island over the past six months, with 238 cases being Hawaii Island residents and 26 being visitors. 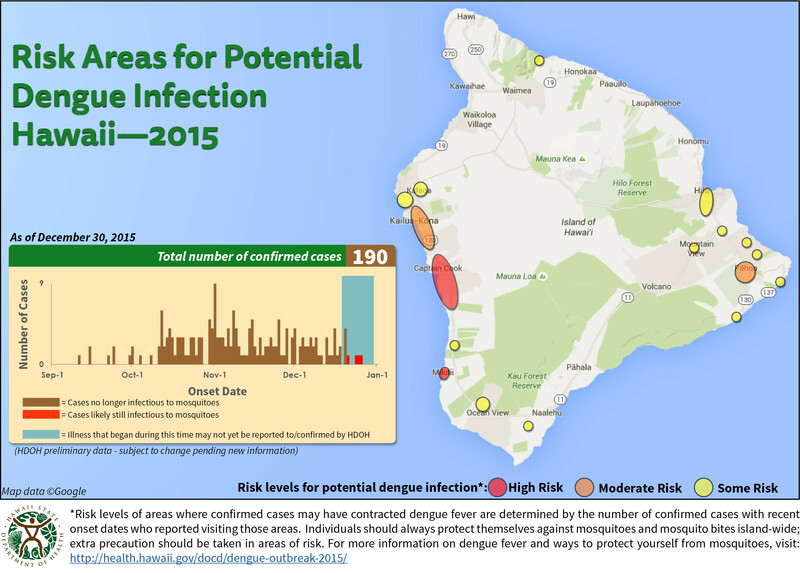 No locally acquired cases of dengue fever have been reported on any other island in Hawaii. Dengue fever is not endemic to Hawaii, but can be imported by infected travelers from endemic areas. The Hawaii Department of Health started the Fight the Bite campaign to help residents and visitors protect themselves from infection. Now, Szigeti says the focus is on preventing any future outbreaks of dengue fever in Hawaii. So if you’ve been holding-off on booking that Big Island vacation because of dengue fever concerns, you can put those concerns to rest. Call Hawaii Aloha Travel now to get the best deals on Big Island Hotels and Big Island Activities — and know you’re safe from dengue fever!